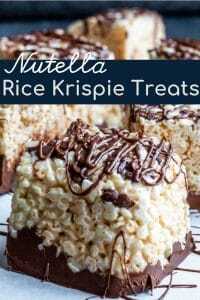 What Do You Need to Make Nutella Rice Krispie Treats? 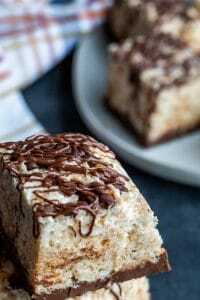 How Do You Make Nutella Rice Krispie Treats? Ah the classic Rice Krispie Treat: simple, fast and freakin delicious. Also, one of my favorite treats from my childhood. 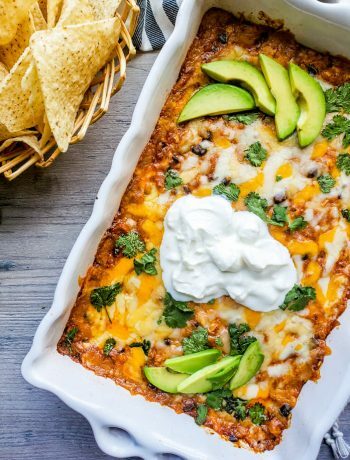 My idea was to take the classic recipe we all know and love and step it up a notch. 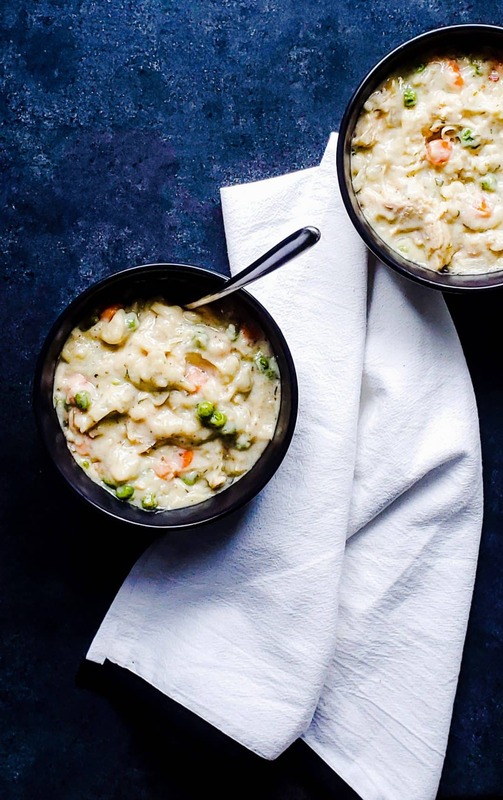 Still very simple, even more delicious and perfect for both kids and adults. 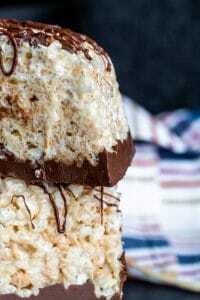 First, you will want to start by making a classic Rice Krispie Treat. Melt the marshmallows and butter together and mix that with the Rice Krispie Cereal. Super simple. If you need more help the directions are on the back of the cereal box. Once you have that done it is time to add the extra step and mix it up some. Next, spray your pan with cooking spray and sprinkle some chocolate chips in the bottom of the pan. These will stick to the Nutella Rice Krispie Treats once they are done. Then add the Rice Krispie mixture in the pan and press down with your hands until even. Now for the good stuff. Second, in a sauce pan (or the pan you just used for the marshmallows) add the Nutella and remaining chocolate chips and warm until melted and smooth. 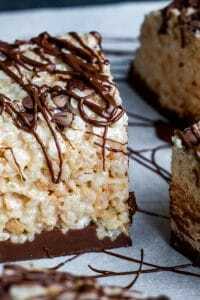 Pour this mixture over the rice krispie treats and use a spoon to smooth it evenly over the top. Finally, place the pan in the fridge for 30 minutes or until the chocolate is set. Once the chocolate is set, slice and serve! 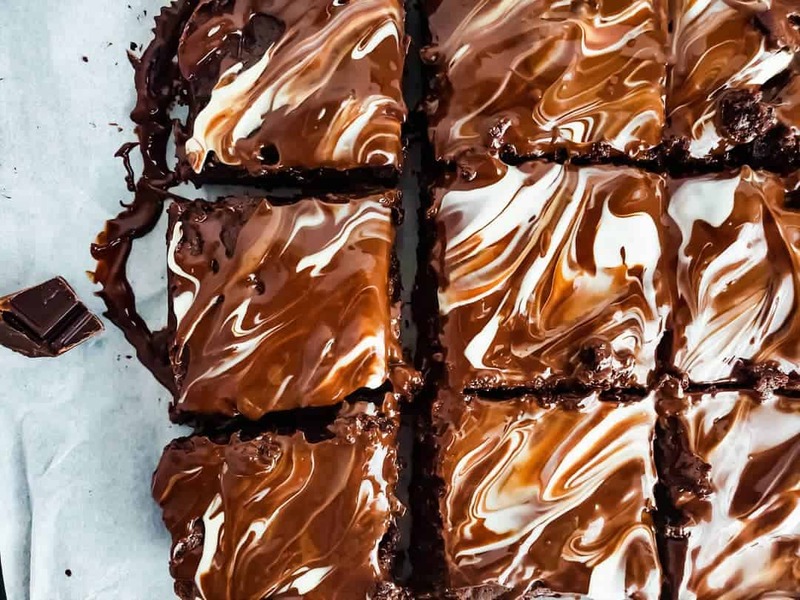 Also, if you are feeling fancy, you can drizzle melted chocolate over the tops of the finished Nutella Rice Krispie Treats as well! 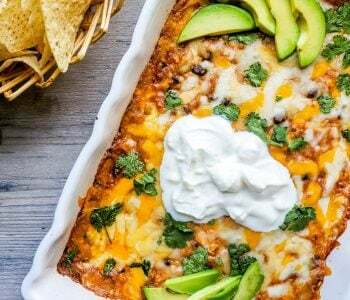 Pan Size: For this recipe you can use a 9×9 or Loaf pan. I used a Loaf pan because I wanted the treats to be really thick. 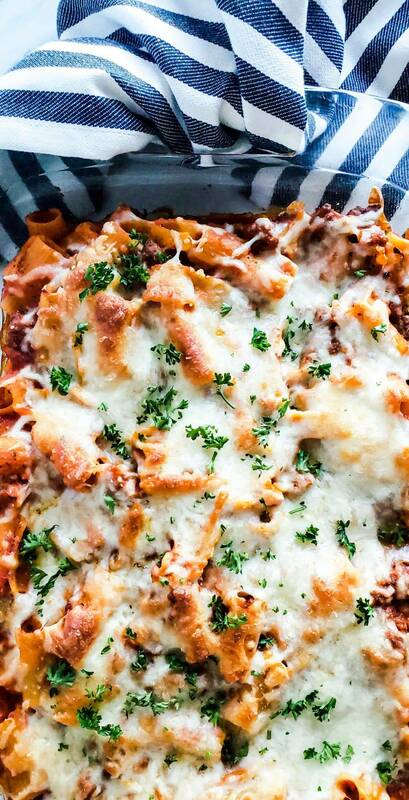 If you want the more classic square shape, go with a 9×9 sized pan. Sticky Fingers: To avoid your hands from getting sticky when pressing the rice krispies into the pan, spray your hands with cooking spray! 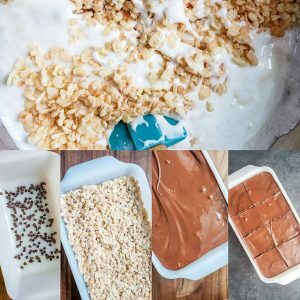 Alternate Preparation: Instead of pouring the Nutella/chocolate mix over the rice krispie treats in the pan, you could mix it all together THEN press the treats into the pan. This will help you avoid the chill time for the chocolate to set. It also means that your treats won’t be very pretty to look at. When doing the treats this way they taste the same, but they aren’t winning any beauty pageants. Storage Suggestion: Store in an airtight container at room temperature for maximum shelf life, about 5 days. 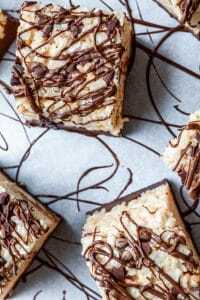 A classic rice krispie treat plus Nutella and chocolate?! Yeah, these are as good as they sound. 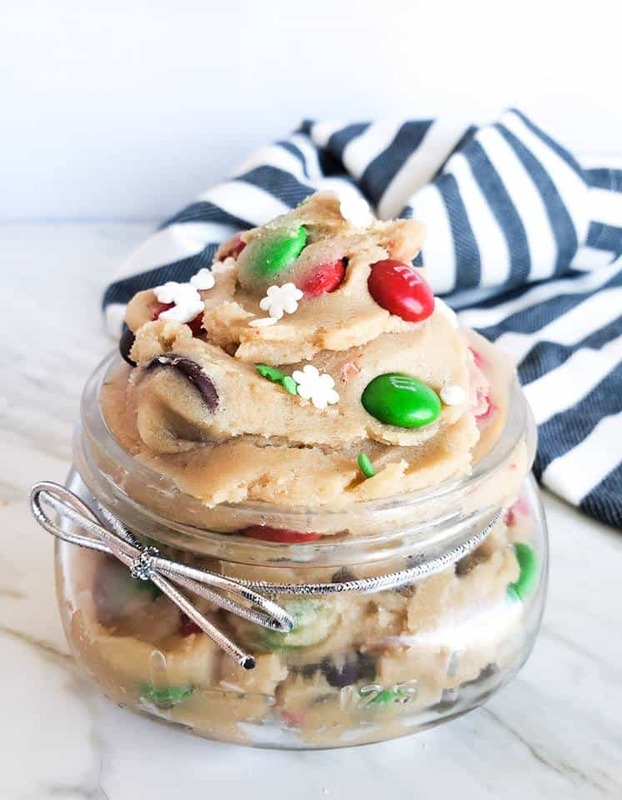 In a medium sized pot add butter and mini marshmallow and melt over low heat stirring continuously to avoid sticking. Once melted, add to a large mixing bowl with rice krispie cereal and stir to combine. Set Aside. In an 9x9 (or loaf pan) greased pan sprinkle 2 tbsp mini chocolate chips. Add rice krispie mixture into the pan and press until even. In a small saucepan add remaining mini chocolate chips with Nutella and warm until smooth. Pour over rice krispie mixture and cool in fridge until chocolate has set, about 30 minutes. Once set, slice and serve, enjoy! 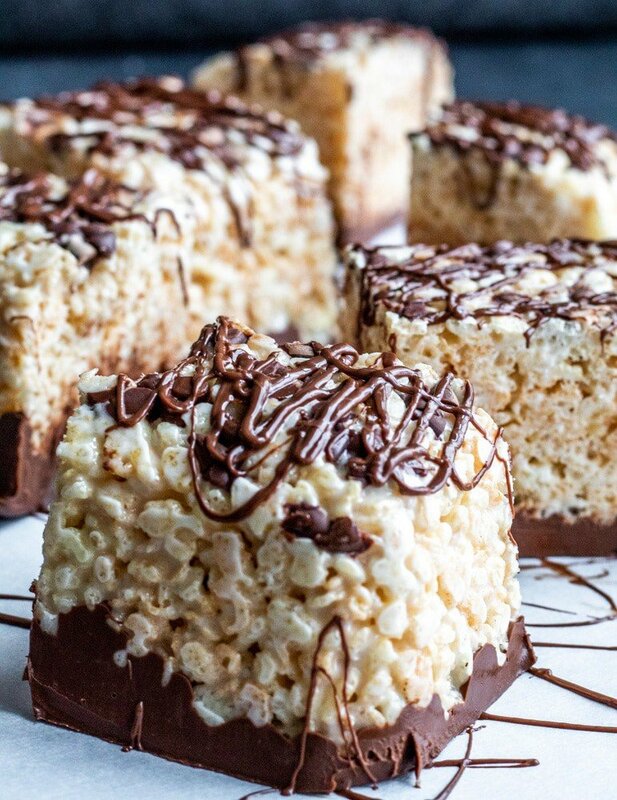 Optional: Sprinkle melted chocolate over the top of the finished rice krispie treats. Simply melt chocolate chips in a small bowl in the microwave and use a spoon to drizzle over the top. *Spraying your hands with cooking spray when pressing the rice krispie treats down helps keep your hands clean. *If you want big and chunky treats use a loaf pan, if you want them more of a classic size then use a 9x9 size pan. I dont even know what to say about this! But WOW!! chocolate, marshmellows and nutella! Does it get any better than that?! 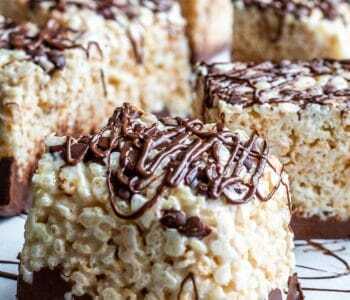 My kids love both Rice Krispies and Nutela. Thank you for the detailed recipe and storage instructions. Can’t wait to make it. 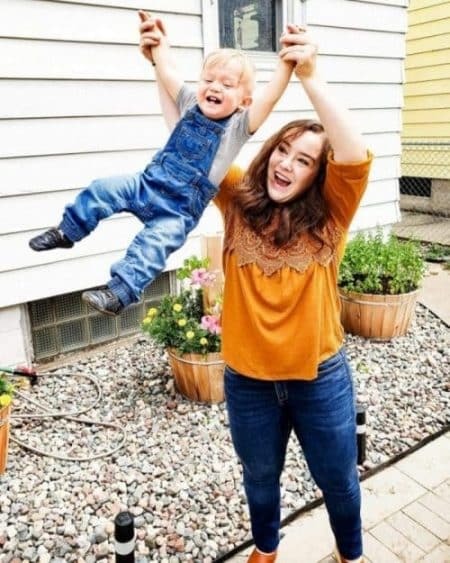 My son loves them as well! Oh boy do this look delicious! I love me some homemade Rice Krispie treats! Same! They have always been one of my favs! Oh what I would do for one of the (or twelve!) right now! 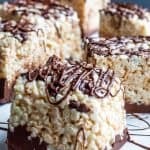 My husband loves rice krispie treats and makes them almost every Sunday on his “cheat day.” 😀 I’m showing him this version ASAP! 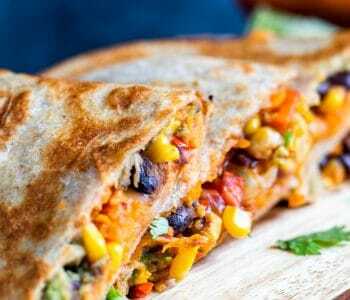 These are def perfect for any cheat day! I’ve only tried Rice Krispie Treats a few times and never been a fan. However yours elevate it to a whole other level – I think I could definitely relish these! Yes the Nutella helps makes them not so boring!